Interview by Suzanne Wilder. Photography by Maggie Heath-Bourne. I’ve been in Cincinnati for 10 years. I have written six novels. I have two children: 13 and 10, a girl and a boy. We live in Northside. I grew up military, so I've lived in a lot of different places. This is the longest I've ever lived anywhere. I'm head of the English department. We moved here for this job. What did you do before you got here? The year before I got here I was a visiting writer at Murray State in Kentucky. Before that we lived in North Carolina, outside of Chapel Hill, and I did two different visiting writer years, one at Vanderbilt and one at Sewanee in Tennessee. But I also worked as a freelance copy editor for Duke University Press, and I was writing. I think you're kind of living the life that a lot of people aspire to when they major in English or start down that path. So is this, where you are right now, what you expected your career and your life to be at this point? Yes and no. It probably depends at what point you'd asked me. So if you asked me when I was in undergrad, what I was picturing at that point was actually that I would be a journalist. So that was what I thought you did with an interest in writing, and partly because I didn't know how you made a life as a fiction writer. The fiction writers that I read in high school were either dead, or they were writing romance or fantasy novels. I thought what I would do was be a journalist. I was editor of my high school paper, and I was editor of my college paper, and I interned at the Nashville paper and at the Memphis paper when I was in college. And then my senior year, a writer named A. Manette Ansay came to Vanderbilt. She was the one who embodied for me that it was possible to pursue a career as a fiction writer, and she was the one who told me about MFA programs. Once I started down that path then, perhaps, I think I was still very focused on the writing and publishing part of the career, rather than the academic part of the career. I never imagined I would end up a department head. I didn't even imagine that two or three years ago. So that part of it is has come about because if you are faculty, and you turn out to have some administrative skills, then people want you to keep employing them. You get asked to do these jobs. That's part of it I hadn't really pictured. But the part of it where I had published six novels, sure, at a certain point, that's what I would have imagined. "I pay a lot of attention to human behavior and that certainly characterizes my work, which is very preoccupied with people's emotional and psychological conditions." I think writing is a weird career – like other careers in the arts. Because the top of it, the pinnacle of the career, is so high that there's a way in which everyone's measured against the top of the career. So when you meet people who have nothing to do with the writing world, and they ask you what you do, they will often say, “Oh, have you ever been on the bestseller list or have I heard of you?” And you know, typically the answer to both of those things is going to be no. This new book is about actors, and there's a relationship, there's a similarity there, where people who are working actors, who have made a living as actors, are in the very top percentage of that profession. But if they're not movie stars, then there's a way in which the public perceives them as not having fully made it. And they sometimes perceive themselves that way, too. It's a funny thing about the arts, where it's so difficult even to get to a point where you're publishing at all, where you're acting at all, where you're part of a ballet company. Where did the story and the idea come from for Charlie Outlaw? So I read an interview with Benedict Cumberbatch. He talked about being carjacked while he was on location in a foreign country. They tied his hands and tried to force him into the trunk of a car, and then ultimately left him there on the side of the road. This was before he was famous. It just seems so bizarre that happened to him. And that just stuck with me. And then I started thinking I would write about an actor who got kidnapped. But I didn't know anything about kidnapping, and I didn't know that much about acting, either – besides what we all kind of pick up from the culture from reading Entertainment Weekly or listening to DVD commentaries or whatever. So I set about doing research on both. To do the kidnapping research, I read every kidnapping memoir they had in the library and a couple of others besides. And I watched episodes of this TV show called “Locked Up Abroad.” Some of those are about going to jail; I just watched the kidnapping ones. It was a reality-like, interview-plus-reenactment show. To do the acting research, I went out to LA. I knew people who were working in the business. One was one of my best friends from graduate school, a fiction writer who's become a TV writer. And the other is my brother-in-law, who is also a writer but works in casting as his day job. So through them I was able to visit sets and talk to actors and talk to other people working on sets and watch an audition and go watch a sitcom being filmed in front of a studio audience. There was also an actress that I knew a little bit because she had optioned my very first book. And I called her up early in the process and she talked to me for a couple hours and answered my questions. And then one of the actors I was talking to said, “Do you know anything about craft and how actors are trained?” and I really didn't. So I went over to CCM, and they let me watch some acting classes and stage-combat classes, and then I started reading acting technique books. "It's great when people read your book and love it, but there's nothing better than just being in that moment where you're like, oh, yes this is working. You know, that's really why we keep doing it. That’s the fix." As that was informing the writing, this other strand emerged in the book, which was about Josie, who's the female lead. Because I realized as I was doing all that research in LA that I wanted to have a storyline that was set in a place that I could make maximum use of that research. So Charlie's been kidnapped, and you follow him and you follow Josie as she goes about her life in LA and slowly realizes that something's gone wrong with Charlie. One of your previous books, The History of Us, was set in Cincinnati. You have talked about place being really important, or sort of a factor in what you write. Is there a personal connection to the places in the current novel? Well, the island is made up. But also LA. I've visited a number of times. I think it has a very particular culture. Obviously it's been rendered over and over in all kinds of film and television and novels. It also has a particular place in our collective psyche. And I don't think you can write about actors and fame without reading at least a little bit about what it's like to live in LA. When I write about place I am always thinking not just about the physical details, but about the feeling of a place. I think growing up military and moving a lot makes you very aware of how each place presents its own culture, and how places differ from each other, how it feels different to live in different places, and how it makes you a different person to live in different places. How do you think it made you a different person since you did live so many places? Do you feel like you picked up a little bit from each place that you lived? Yes. Overall, I would say that I am adaptable. But if you get into some specifics, I think that moving from, for instance, Fairfax County, Virginia, where the kids in my elementary school had a lot of highly educated parents employed in the government, to small-town New Mexico, where everybody in town went to the same high school and my family was “rich.” My family, which was a military officer and an elementary school teacher, we were rich in New Mexico. And then I went to Vanderbilt University, where I was decidedly not rich. There were BMWs parked in the dormitory parking lots. So I think that that shaped me in several ways. One is that I definitely have a sense that everything is perspective. Another is that I'm comfortable with a lot of different kinds of conversation. I'm comfortable with someone who wants to have a very intellectual conversation about literature; I’m comfortable with someone who wants to talk about a relatively dumb TV show. It’s helped to make you a chameleon. You used the word perspective, and it sounds like that’s the right word. You were able to see lots of different locations, but also people and culture. It's easier for me to talk about how I think it shaped me overall than what I think I got specifically from different places. So it has made me a bit of a chameleon. It's made me more adaptable. It has given a flexibility to my language. I mean I lived in England; I had a British accent; I used British idioms. Then I moved to Lansing, Kansas, where they made fun of me for those things, and I adapted to that language. And I lived in New Mexico, where I had a Texas accent and said things like dang and fixin‘ to. I do think in terms of being a writer that it's given me enormous flexibility in the types of language that are available to me. I also think that when you move a lot and you have to adapt to new situations, it makes you really attuned to other people's behavior, because especially as a child, you're taking cues from other people, like how am I supposed to act here? I pay a lot of attention to human behavior – what they say, what they do, and what that leads me to imagine they're thinking – and that certainly characterizes my work, which is very preoccupied with people's emotional and psychological conditions. You mentioned that this is the longest you've been in one place. I read your interview with Curtis Sittenfeld a few years ago in Cincinnati Magazine. One of the things you said was there is a sense of community here that you really like. Tell me more about that sense of community and how that has affected you. Well, I think the longer you live here, and the more things you get involved in, the more overlap you realize. People always say it’s a large small town, and there is a way in which that's true. You start to run into the same people, whether that's because you're going to the ballet, and you see a lot of the same people there, or now that I'm researching local politics and showing up to political things I'm realizing that's a little world and everybody knows each other, and I'm meeting those people, too. The different neighborhoods have a strong sense of culture and community, and people do feel a neighborhood pride here. In Northside that's exemplified in the parade, where everybody comes out, and it's just so incredibly, delightfully eccentric, and it feels like everyone is participating in this assertion of who we are as a neighborhood. And I like that. What has kept you in Northside specifically? I think I identify with the slightly more eccentric, slightly scrappier feeling of it. I have mixed feelings about the way the neighborhood's changing, like it's great to think that your home values are going up, but I don't want it to become a place where everyone goes to work in a suit. Nothing wrong going to work in a suit. But I like that it has that eccentric quality. And there are people from a variety of socioeconomic backgrounds there. I also like my house. We have good friends in the neighborhood who live right around the corner. I don't think I'd ever really lived any place before where, certainly not as an adult, where I had friends literally around the corner. I think people are very curious about how people write, like this sort of idea of you in an office, typing on a typewriter. So tell us about the physical act of writing for you, like where do you do it, and what's your writing preference. I have a study on the third floor of my house, and I write on a computer, and I usually have music on. When I am starting a project, I'm usually hunting for music that seems to me to suit the mood. That can change depending on what kind of scene I'm writing. When I get stuck I will switch to one of two things. I will go for a walk and dictate ideas into the phone, or I will switch to a notebook – pen and paper. Doing both of those things frees up my mind because it doesn't feel permanent. I know that there's going to be another step of moving from the recording or the notebook to the computer. So I think if I've been staring at a scene and just feeling like I don't know what the next sentence is, that using the notebook or talking is a way of saying, it doesn't matter, or you can work it out; you can play with things. During the school year I don't have a great deal of time to write. I try to work at least one day a week, but that doesn't always work out. And then I have been, the last several years, going away for a week at the end of each semester to a writers colony, so I can just work intensively the whole time. If I have managed to stay in touch with the book over the course of the semester, there's usually a kind of buildup, so that I produce a lot once I have that time and space and solitude. The most productive writing time is when I go away because that's all I have to do. I don’t have to clean my house. I don’t have to carpool anybody anywhere. I don't have to teach a class. I don't even have a TV. So this space kind of opens up mentally when you know that's the case. Do you have something you’re working toward now, as a bigger goal? If I were to have big ambitions about my career, they would be the same stuff I fantasized about when I was 25. Like being on The New York Times bestseller list. But those ambitions are not really helpful, because you ultimately can't control that stuff. It's self-destructive to think about your art purely in terms of external response to it. You might change what you do well and not even hit that target. And the other thing I've learned from having a publishing career is that the good things that you get are thrilling and satisfying, but they're not sustaining. So if you hear that some outlet is reviewing you, you're excited, but you're not still excited about that six weeks later. If you were to be buoyed and affirmed entirely by the external stuff, you'd be miserable most of the time. What has to keep you going is your ambitions for the work itself. So I'd say my ambitions are about the work itself, and that's going to change. I don't have a grand ambition. I will have an ambition for each different book. In terms of subject matter, my ambition for this book was to try to get it right, what it's like to be a TV actor, to portray that as realistically as possible. I wasn't interested in doing satire; I wasn't interested in over-glamorizing the experience. I wanted to show what it is actually like. My ambition technically was to play around with that omniscient 18th-century narrative style. And I suppose I could say my overall ambition is to keep challenging myself, in terms of what I do, but there's not a specific target that I’m trying to hit. I'm trying it to continue to take satisfaction in the work. It's great when people read your book and love it, but there's nothing better than just being in that moment where you're like, oh, yes this is working. You know, that's really why we keep doing it. That’s the fix. So one person who comes to mind is my maternal grandmother. She represented breaking away from the norm, in terms of what was expected of women. She was a nurse, and she was in the Army nurse corps in World War II, in the European theater in a field hospital. After my grandfather died, she remarried. Then she divorced. After that, she went back to school and got a doctorate at Vanderbilt, and she was high up in one of the hospitals in Nashville; she was head of all the nurses. There's World War II stuff in The New Neighbor that was influenced by her. She was still alive at the time, and I interviewed her quite a bit. After she died I found a box of letters home that she had written during the war in her house and a scrapbook, and then I also read a great deal about nurses in that era. So I ended up using some of that material in that book. She just embodied being smart and independent and kind of no-nonsense and departing from the kind of conventional idea, certainly for her time, of what a woman could be and do. 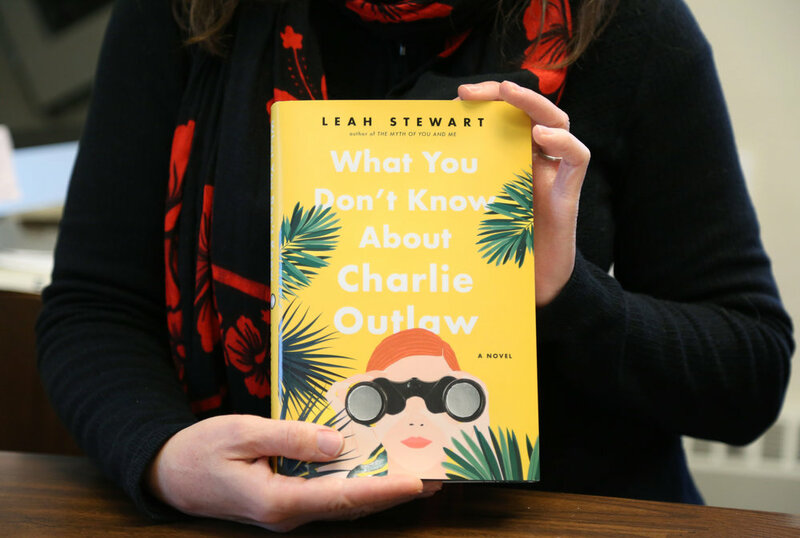 Leah Stewart will be at Joseph-Beth Cincinnati on March 28 to celebrate her new book.